The Kermadec Islands consist of 13 islands and islets, located between 800km and 1000km north-east of New Zealand. Macauley and Raoul account for over 95% of the land. This chapter examines their origins. The islands are volcanoes of the Kermadec Ridge, pushed up by the Pacific Plate which subducts into the deep Kermadec Trench. The geology of (submarine) volcanoes and a geologic description of each of the islands, Raoul, Macauley, Curtis & Cheeseman and Esperance. 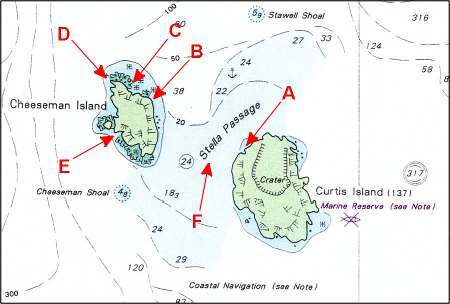 (on this page) For charts of the islands, visit the chapter on dive sites. Topographical map, as can be obtained from the Department of Land Information NZ (LINZ). Homepage: www.linz.govt.nz Detailed (1:25,000) topographical map of Raoul (free, 2MB): http://ortho.linz.govt.nz/nz_offshore_islands/raoul_high_res.jpg. Also some photographs of the island. This map shows New Zealand in relation to Australia. It also shows NZ's outlying islands and its Exclusive Economic Zone (EEZ). The Kermadec islands lie NE of New Zealand, roughly in the direction of NZ's main axis. Their distances apart and their distance to the North Island happen to be of the right size to add a considerable area of EEZ. As can be seen, Norfolk Island which is administered by Australia, lies roughly at the same latitude of about 30ºS. 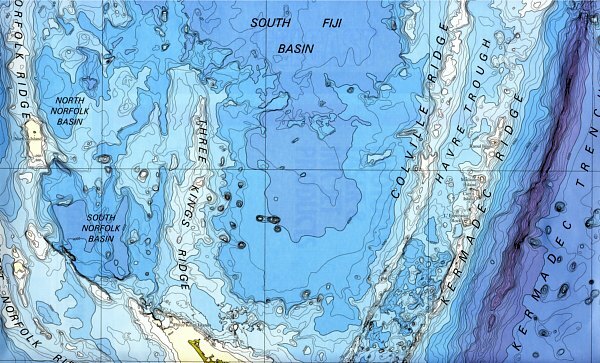 The detailed map of the sea bottom, shown below (Map courtesy NIWA) reveals that the sea bottom has major features such as the 8km deep Kermadec Trench on right, and west of it the Kermadec Ridge, which provides the volcanic activity to bring the Kermadec Islands to the surface. further west the Colville Ridge, which is of older date. In the middle the South Fiji Basin, a large area of deep ocean floor of 3-4km deep. To the left the Three Kings Ridge, also formed much earlier than the others, and finally the Norfolk Ridge with the submarine volcano of Norfolk Island, which has a very large plateau on it. At the very bottom of the chart, the northern tip of the North Island can be seen. Please take note of the location of the Kermadecs, in order to locate it at world maps used further down this chapter (and the chapter on ecology), on which they are not marked. The marine reserve created around the Kermadec Islands consists essentially of four circles of 12 nautical miles (22km) radius, centred around every outcrop, amounting to three disjoined areas adding up to 7480km2, but separated by gaps of 15-25 km. As can be seen from the map, most of the marine reserve consists of blue ocean to a depth of 1000m and some of it even to 2000m. Most of the sea bottom is found deeper than 500m, out of reach of daylight. The main habitat it protects is thus blue ocean with very little life, and a muddy sea bottom, as dark as the night, with here and there a rocky outcrop with filterfeeders attached. How much of it is there and what it looks like, is not known, because it is still being investigated. On the world map of tectonic plates, one can see that an important subduction zone between the Indian-Australian plate and the Pacific plate, runs through the Kermadecs and through the main axis of NZ. These two plates mainly slide past each other, which makes the subduction component weak. As the Pacific plate slides below the other, it pushes the other margin up, resulting in a ridge. The melting plate which is drawn down, causes volcanic activity in the area of the ridge, rising from about 100km depth, resulting in volcanoes rising up above the ridge. Such volcanoes formed the islands of the Kermadec Group. Subduction zones are usually found where ocean plates meet continents, as the map shows, and the situation of one ocean plate subsiding underneath another ocean plate is uncommon. The two plates move relatively to one another at the speed of 7cm per year, which is relatively fast for such a process. The diagram shown here (courtesy Institute of Geological and Nuclear Sciences), illustrates to scale the extent to which the Pacific Plate is subducted. From the locations of deep earthquakes, it is concluded that the plate is drawn down to a depth of over 600km. But shallower, at around 100km, very hot magma is formed, which is pushed upward through cracks in the Australian Plate, forming volcanism. Rising heat also buckles up the crust to form the Havre Trough. This volcanic area is closely monitored because eruptions could be hazardous to passing ships and overflying aircraft. Jet engines are extremely sensitive to volcanic ash. Serious submarine slumps could also threaten New Zealand with a tsunami - dangerous because of its short warning time (1-2hours) and close proximity. 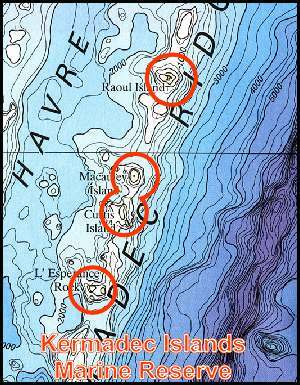 All the islands in the Kermadec Group have been formed by volcanic eruptions. Usually the first phase of a volcano starts with violence and the release of trapped gases under very high pressure. As the liquid rock is blasted into the air, the dissolved gases expand, pulverising the rock to ash, pumice and scoria, most of it falling down on the volcanic cone (tephra). Such cones are thus built up from layers of tephra, and the volcano is called a stratovolcano (stratum=layer). As the volcano grows older, its activity diminishes and its eruptions become less violent. Eventually it may just ooze liquid lava, forming a cap on the cone (shield volcano). When a submarine volcano reaches the surface, its cone becomes subjected to heavy erosion by waves, most tephra being worn away as fast as it is laid down. A large flat top may remain, with protruding cores of rock, which once were crater plugs. Deeper than 100m, the action of waves is no longer felt, and their erosion negligible. While a submarine volcano remains under water, the ash cannot travel far, and all tephra lands on the cone, building the volcano fast and steep. During the last ice age, when the ocean level was about 120m lower than today, the islands must have been much larger. Ironically, both Curtis and Macauley are volcanoes with very flat tops at 120m depth, and they may have been as large or larger in area than Raoul at the time. Now these gently sloping flatlands lie just within reach of daylight, hosting fish life much richer than that found deeper down. The outlying Meyer and Herald Islands were formed from underwater eruptions, 0.5-1.5 million years ago. Stratovolcano: (L: stratum=layer) These are steep volcanic cones built by both pyroclastic (thrown by fire) and lava-flow eruptions. They are composed of volcanic rock types that vary from basalt to rhyolite, but their composition is generally andesite. Stratovolcanoes may erupt many thousands of times over life spans of millions of years. A typical eruption would begin with ash explosions and end with extrusion of thick viscous lava flows. The cone-shaped form begins gradually and becomes steeper (up to 35°) toward the summit, which generally contains a crater. Tephra: (Gk: tephra= ash) loose material, e.g. ash and pumice, deposited by volcanic eruptions. 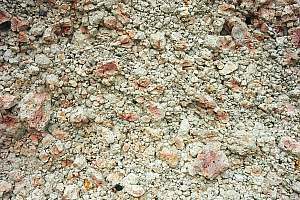 Dacite: An extrusive igneous rock in composition between rhyolite and andesite, consisting mainly of the minerals feldspar and quartz. Tholeiite basalt: A basalt resembling that found in Tholey, Germany. See also the geology glossary on this web site. Right-click on this link and open it in a new window for ease of reference. Raoul is a stratovolcano, composed of material ejected from several eruption centres, mostly andesitic tuffs. The Herald Islets were the first to be active, and the Denham Bay crater is estimated at 2100 years of age. Raoul erupted 14 times above water. What happened before, is not known. From 1800-1995 eruptions happened simultaneously from both calderas. The last eruption happened on 21 November 1964, forming 12 small craters in the caldera, while ejecting clouds of ash. In 1965 another eruption happened, and in 1994 earth shocks only. Located around 29.27S, 177.92W. Raoul measures 29.25km2 (2925Ha), which is slightly smaller than Norfolk Island (no longer volcanically active), which measures 34km2 (3400Ha). 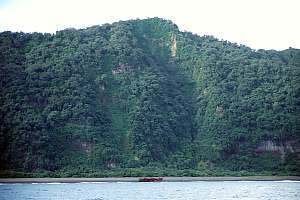 Mount Moumoukai is Raoul's largest mountain, rising to 516m. The island has two lakes and a freshwater lagoon at Denham Beach. Its caldera (crater) is 3.3km wide, and there is a second crater in the rim of cliffs. A third crater is found in Denham Bay. For charts, visit the chapter on diving. f214519: The crumbly structure of the rock, close to the foot of a cliff, is made up of porous scoria, pumice and ash. Macauley is quite a substantial volcano, standing on a base over 900m deep, where it measures 380km2. Built from tholeiite basalt and interbedded dacite tephra, the island measures about 3.1km2. 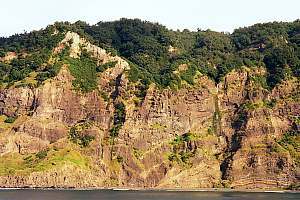 Continued eruption of thin basalt flows built a large shield volcano with a smooth but hard top at 150m high, where a small crater can be found. Only a few thousand years ago, a large eruption of dacite tephra (Sandy Bay tephra) caused the collapse of the flanks of the submarine volcano to form a caldera immediately NW of the island. The magnitude of this eruption was larger than Mt Krakatoa and comparable with that of Lake Taupo. Renewed basaltic volcanism produced scoria cones, flows and tephra, and the final stage of this eruptive phase was associated with the collapse of the NW edge of the island into the caldera, estimated 6300years ago by carbon dating of Sandy Bay tephra. This caldera lies about 1000m deep. Future eruptions at Macauley are likely to be submarine, with the danger of a catastrophic tsunami. The total land area of Curtis and Cheeseman is about 60 Ha (147 acres). Curtis remains active with daily earthquakes and small eruptions destroying the vegetation in its caldera. The islands are the eroded peak of a large volcano, measuring 25x15km at its base on the Kermadec Ridge. The rocks of these islands stem from pyroclastic poorly-bedded ash deposits. Curtis has been rising by 18m in the past 200 years. Previously known as French Rock, l'Esperance is but a pinnacle rising up steeply from the surrounding sea floor: 100m directly off the pinnacle, while its submerged mountain rises from an 800m deep ridge. 250m in diameter, it measures optimistically 4.8 Ha (12 acres). l'Esperance has no volcanic activity and has been like that for many thousands of years. The topographical map of Raoul shown here is part of the map which is freely available from the LINZ web site. 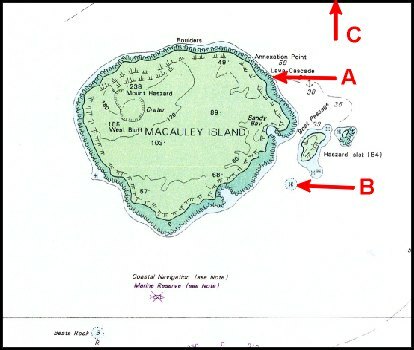 The inset shows the location of the buildings, and it covers the most inhabited part of the island. 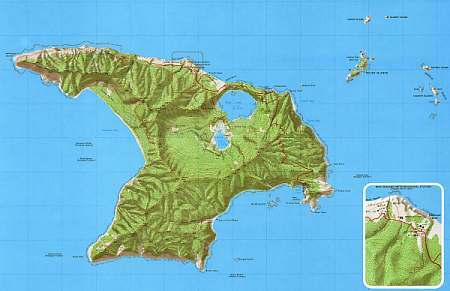 The map shows graphically that Raoul is completely covered in forest, where the steep cliffs are and the sandy beaches. Best of all, its shading shows the shape of the crater's deep impression, the caldera. It can now also be seen that Denham Bay forms another crater, to the west of it. A large part of the rain falling on Raoul, ends up in the crater lakes, which are 3-6m above sea level. Excess water drains through the porous rocks out to sea. f214504: This is the first view of Raoul, when arriving from New Zealand, from a SW direction. The typical anvil shape of the island cannot be discerned. From this angle, most of what one sees on left, is Denham Bay, with Hutchison Bluff far left. On the far right, d'Arcy Point and one third left of it, Smith Bluff. The highest point seems to be Hutchison Ridge (476m), on left, but Mt Moumoukai (516m), lies in the far back, one third from right. f214702: Most of the island consists of layers of tephra, compressed to soft rock. It wears away rapidly in some places, as shown here. Notice how some layers are thick, and others narrow, waving up and down with the shapes of the valleys. f214703: The cliffs around Denham Bay are old, and well covered in native forest. Here and there a slip or rock fall shows. These cliffs are not under threat from the sea because of the beach and low flats sheltering them from the waves. In the middle of the photo the wreck of the Japanese fishing boat Kino Maru 2.